Published: June 11, 2018 at 10:20 a.m. Updated: June 11, 2018 at 11:17 a.m. If Hollywood can subsist on reboots and sequels, why can't the NFL? After a decade in the broadcast booth, Jon Gruden is trading one headset for another to reprise his role as the Oakland Raiders' head coach. This Raiders redux has a bunch of new characters, but there will be plenty of trademark Gruden gruffness to go with it. To wit: Gruden's comment that he's "trying to throw the game back to 1998." In that vein, we're also going back to 1998 -- Gruden's first year as an NFL head coach -- and coming up with the best player at each position to have played for Gruden in his stints helming the Raiders (1998-2001; 2018-present) and Buccaneers (2002-08). I'll tell ya what: This is gonna be wild, man! Ground rules: This list only includes players who played for Gruden as a head coach -- don't tweet me asking about Brett Favre and Ricky Watters -- BEFORE the 2018 season, which hasn't happened yet. Gannon had been an unremarkable journeyman quarterback with stops in Minnesota, Kansas City and Washington before joining the Raiders in 1999 and turning his career around. In three seasons with Gruden, Gannon averaged nearly 3,700 passing yards (back when that was a big number) and made three straight Pro Bowls. Gannon would win the NFL's MVP award in 2002 ... though Gruden and the Buccaneers would ultimately wreck the Raiders' season. By the time Gruden got to Tampa, Alstott's best days were behind him. But in his prime, the bruising back frequently had opponents making business decisions. Gruden says he plans to bring fullback usage back into fashion in his current tenure with the Raiders. If so, it's likely because there are visions of Mike Alstott trucking defenders dancing in his head. Garner played one year for Gruden in Oakland, joining the Raiders after a pair of uber-productive seasons across the bay in San Francisco, then wrapped up his career with a stint under Gruden in Tampa. While the duo of Charlie and Chucky never quite matched the statistical prosperity that Garner enjoyed with the Niners, Garner's 1,417 yards from scrimmage in 2001 were a catalyst for Oakland's playoff run that season. Garner wasn't the only player to defect to the East Bay in 2001. After 16 glorious seasons with the 49ers, Rice donned the Silver and Black for the first of three and a half solid seasons at a time when many wondered how much he had left in the tank. This was actually the second collaboration between Rice and Gruden -- the two were together in San Francisco in 1990, when Gruden was a 49ers offensive assistant. When I was in the sixth grade, I was the Mac Tonight moon for Halloween. Google it, kids. Ignore that it was free pub for a fast-food joint; I was 10 and he was very popular. I was the classroom hit -- until my best friend showed up dressed as a full haunted house. Anyway, that's probably how Tim Brown felt before Jerry Rice joined the Raiders. The list of tight ends who have played for Gruden is, well, um ... not great. Dilger had a respectable run as the pass-catching tight end in some potent Colts offenses. By the time Dilger joined the Bucs for his final three NFL seasons, his production had waned somewhat. Though he did contribute in his final NFL game by doubling as Tampa Bay's long-snapper. What's old is new again. Time is a flat circle. Reunited (and it feels so good). Penn earned a job with the Bucs in 2007 as an undrafted free agent and has steadily worked his way into being one of the league's best tackles. He'll reunite with his first NFL head coach this season in Oakland. Wisniewski was a second-round pick of the Cowboys in 1989 but never played a snap for the Star, instead spending his whole career with the Raiders. In that time, Wisniewski made it to eight Pro Bowls and was on the All-1990s second team while missing just two games in his entire 13-year career. Christy went from being a fourth-round pick in 1992 to being a three-time Pro Bowl selection and the starting center on Tampa's Super Bowl XXXVII championship team. Gruden and the Bucs made Joseph the 23rd overall pick in the 2006 NFL Draft. Two years later, he made the first of two Pro Bowls on his way to a respectable nine-year career. Kennedy was ticketed for early greatness, being the ninth overall pick in 1993 by the Falcons. After three disappointing seasons in Atlanta, Kennedy was traded to Oakland, where he made his name by anchoring the right side of the offensive line for eight seasons. This was the easiest call on the list. Rice's career had gotten off to a good start after five seasons in Arizona, but it went next-level when he joined Monte Kiffin's defense in Tampa. From 2002 to '05, Rice was one of the most feared pass rushers in the league, racking up 56.5 sacks and 153 total tackles from the defensive end spot. By the time Carter got to Gruden and the Bucs, his best days in the league were long behind him. But during his stint with the St. Louis Rams, Carter was a house-wrecker who averaged 13 sacks per season from 1998 to 2000 and was one of the anchors of the Rams' Super Bowl XXXIV-winning defense. Sapp and Gruden were only together for two years before the then-veteran defensive tackle made a move to Oakland. Statistically, those two years might not have been the best of Sapp's Hall of Fame career, but they did feature two of his four career interceptions. Oh, and a Super Bowl. Yeah, that, too. Maryland mostly made his name playing for the Cowboys' three Super Bowl-winning teams in the early '90s. By the time he met up with Gruden at the end of the decade, his numbers weren't quite as eye-popping, but he was still an excellent run-stuffer in the middle of the defensive line. Did I say that Simeon Rice was the easiest call on this list? Because I really just misspelled "Derrick Brooks." Brooks is arguably the greatest player in Buccaneers history, spending his entire 14-year career in Tampa. He was equally magical during Tampa Bay's Super Bowl run, with five interceptions -- including three returned for touchdowns. That's pretty good, right? Biekert was a staple in the middle of the Raiders' defense for nine seasons, but he took his game to another level when Gruden joined the club. From 1998 to 2001, Biekert averaged 100 tackles per season while racking up 10 total sacks. Thomas was a solid contributor for the Raiders, though he did his best work in nine previous seasons with the Eagles. Thomas did save one final quality season for his final NFL year with the Raiders. We won't talk about that year ending with the Tuck Rule Game. Long before he appeared on television sporting stylish ascots, Woodson was tying up wide receivers. 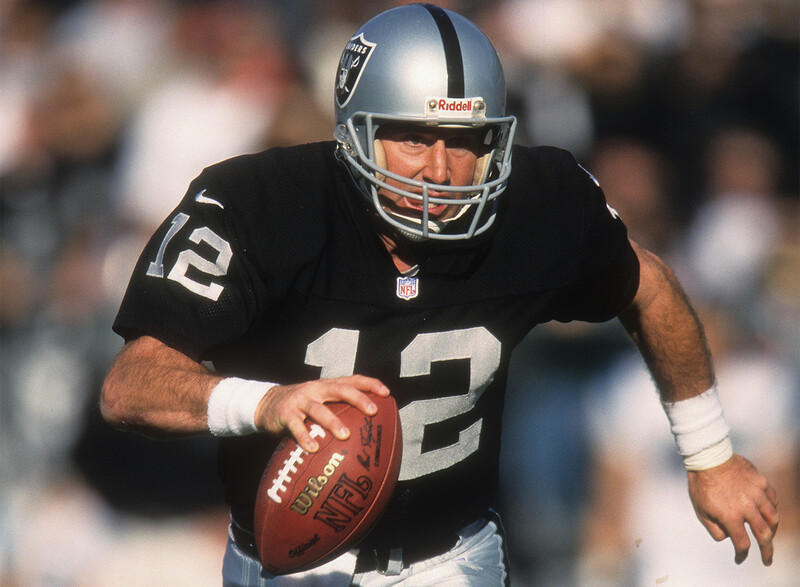 Though when Woodson and Gruden first teamed up, the former was just a rookie fresh off a Heisman Trophy-winning season. In his first NFL season, all he did was intercept five passes and force a pair of fumbles. That's how to jumpstart a Hall of Fame career. Gruden's first two seasons in Tampa were Lynch's final two seasons with the club, though the veteran safety went out with a bang after suffering through some abysmal seasons with the Buccaneers. Lynch would finish his career with the Broncos before eventually moving into the 49ers' front office. Gruden's first season as a head coach was Lewis' final season as an NFL player. While the veteran finished with a respectable campaign in Oakland, he made his living tormenting the Raiders as a member of the Kansas City Chiefs. Jon Gruden spent the 17th overall pick in the 2000 NFL Draft on a kicker. We laughed. Eighteen seasons later, SeaBass was the one having the last laugh while still booting field goals for the team that drafted him. Lechler was drafted the same year as Janikowski -- though his fifth-round slot didn't raise nearly as many eyebrows -- and has consistently been one of the NFL's best punters ever since. There haven't been many return specialists to make a major contribution during Gruden's head-coaching career. So why not honor the man who scored the Buccaneers' first kickoff-return touchdown a scant 31 years after the team’s inauguration?